Halloween is coming to… North Yorkshire Moors Railway! Join us on board the Halloween Train, which will take you and your family on a spooky journey this Halloween! Children and their scaredy-cat grown ups will love meeting our silly, spectacular and sometimes spooky cast of storytellers. Hear their ghoulish tales, join in with their scary songs and be prepared for moments of magic. This will be an evening of Steam & Scream! 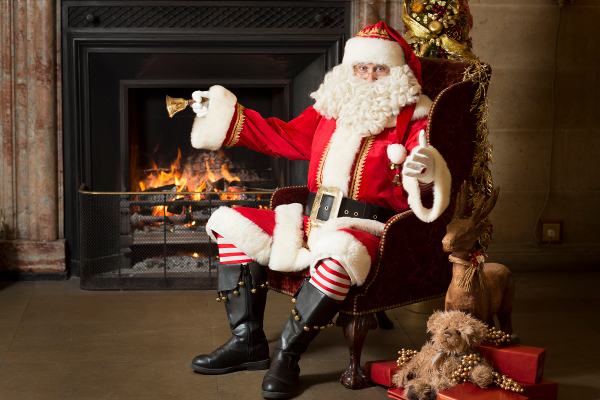 Santa Claus is coming to the… North Yorkshire Moors Railway! Join Santa and his special helpers on a magical adventure aboard the Santa Express, which will take you on a festive journey you won’t forget! Departing from Pickering Station, the Santa Express brings Christmas to life and gives children the chance to meet the legendary man himself on board the train. They will be able to tell him what they would like to open on Christmas morning – providing they’ve managed to keep themselves off the naughty list this year! Santa will visit you in your seat and see if you’ve been good or bad? North Yorkshire Moors Railway. Pickering. We are pleased to announce that we are running special steam hauled excursions to Whitby on Sunday 30th December 2018 & Tuesday 1st January 2019. So why not enjoy a Winter’s day out from Pickering and blow the cobwebs away at the seaside, or perhaps work off some of that Christmas pudding with a brisk walk in the fresh air. These pre-booked services depart from Pickering Station and traverse the North York Moors National Park to Whitby. Here you will have just over 2 hours to spend in the town before the steam hauled service departs from Whitby Station. Sunday 30th December 2018, 10:00 departure from Pickering and 14:00 departure from Whitby. Tuesday 1st January 2019, 09:30 departure from Pickering and 14:00 departure from Whitby. There’s lots going on in the centre of York over Christmas (even if there wasn’t, Christmas in York is so pretty it’s always worth a visit!). St Nicholas Fair, the York Christmas market runs from the 15th of November 2018 to the 23rd of December 2018, with lots of food, festivities and a lovely Christmassy atmosphere to soak up. The Twelve Days of Christmas Castle Howard. Christmas at Castle Howard is a spectacle like no other. Enjoy a truly magical day out as Castle Howard is transformed for the festive season. This year’s theme ‘The 12 Days of Christmas’ will see a stunning array of flamboyant displays and installations to surprise and delight visitors of all ages. This entry was posted in Main News on October 14, 2018 by Jane Wheldon.